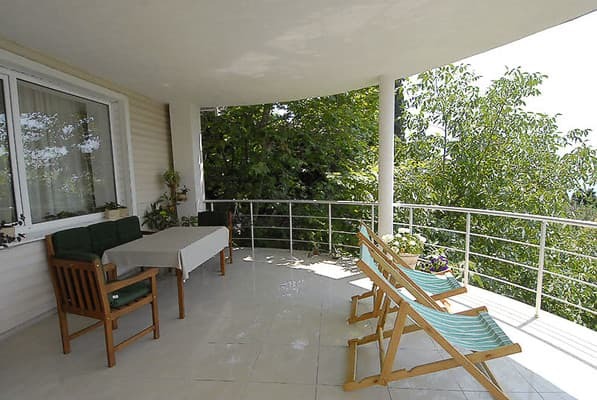 The apartments are located in the private sector, a 10-minute walk from Massandra Beach and Yalta Embankment. 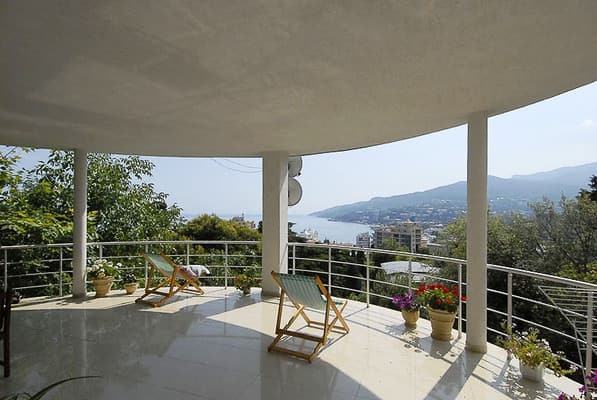 The private house is located in a separate area with a panoramic view of the sea and the mountains, consists of separate 4 rooms. It offers accommodation in one-room and two-bedroom apartments of different types and sizes. All rooms have a private entrance. Each apartment is equipped with a kitchen (stove, kettle, microwave, refrigerator, dishes). The apartment can accommodate from 2 to 5 people. On the territory of the house there is a yard with a barbecue, a garage for one car. Distance to the bus station in Yalta - 2.6 km, to Simferopol - 79,5 km. PRICES MAY CHANGE, IT IS REQUIRED TO RECEIVE INFORMATION FROM THE OPERATOR. Description of the room: The apartment is located on the 3rd floor. Two separate bedrooms with sea and mountain views. In one bedroom - a wide double bed and a soft corner sliding, TV, air conditioning. In another room - a semi-double sofa sliding, armchair, mirrored wardrobe, TV, air conditioning. In the kitchen there is a gas cooker, an extractor fan, an electric kettle, a microwave oven, a refrigerator, a dining table. Small hallway. The apartment can accommodate from 3 to 5 people. The price depends on the season and the number of people. Description of the room: Ground floor, separate entrance, parking near the house. The bedroom has a fireplace, a double bed, TV, air conditioning, a wardrobe, a coffee table. 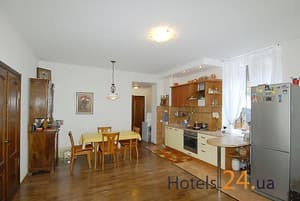 Kitchen with appliances (gas cooker, hood, refrigerator, microwave, kettle), dining table, TV. Extra bed - a sofa bed. A small courtyard with a barbecue and a sitting area. View from the windows of the apartment on the sea. Accommodation 3-4 people. The price is negotiated before booking (depends on the season and the number of people). Description of the room: The apartments are located on the second floor, separate rooms, a large observation terrace and a garage for 1 car. Panoramic views of the sea and mountains, the terrace is equipped with a chaise longue and summer furniture. The room area is 100 sq.m. In the kitchen - stove, refrigerator, kettle, necessary utensils. On the ground floor there is a yard, BBQ, sitting area. 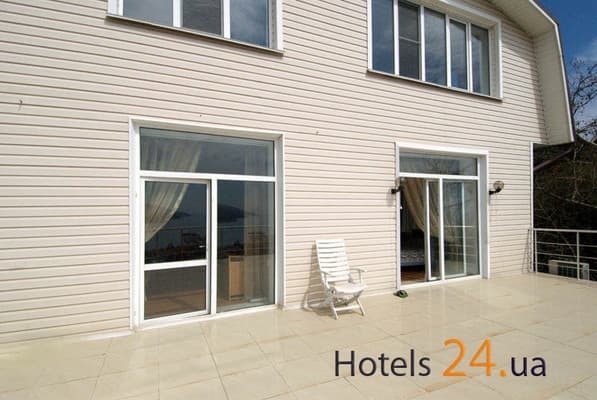 Accommodation - up to 5 people, the price depends on the season and the number of residents. Description of the room: Superior Suite with two separate rooms, panoramic terrace, kitchen, hallway, bathroom and patio with barbecue. Each room has a view of the sea and the mountains. In one bedroom there are two beds, in the other - one bed (one and a half sofa). Cold / hot water, bed linen, dishes. Balcony (area 15 sq.m.) with summer furniture. The apartment comfortably can accommodate up to 5 people. The price depends on the season and the number of people. 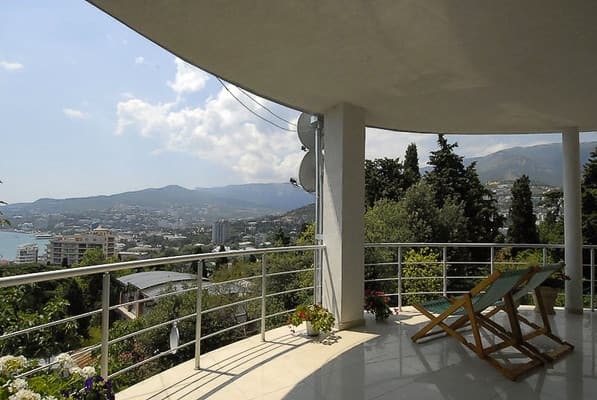 The apartments are located in a private sector within a 7-minute walk from Massandra Beach and Yalta Embankment. In walking distance are shops, restaurants, cafes, entertainment centers. The distance to the bus station in Yalta is 2.6 km, to Simferopol - 79.5 km. From the railway station of Simferopol on any transport to Yalta. Near the railway station of the city of Simferopol (exit to McDonald's, in the direction of the tower with a clock) are auto- and trolleybus stations. From there, by regular bus, fixed-route taxi or trolleybus number 52 you can get to Yalta in 1,5-2,5 hours. By car: from Simferopol, go along the M-18 highway to the Angarsk pass, then through Alushta - on the upper intercity route (landmark, so as not to get lost in Alushta - the wires of the intercity trolley bus), then go along the upper, intercity route (M-18) along the whole The Juba is still 41 km to Yalta. There is a transfer from the bus station of Yalta (service fee of 550 hryvnia per car).